It took Northern Dancer exactly two minutes to become a national hero in Canada. That was how long it took the stocky, bay colt, ridden by Bill Hartack, to run the mile and one-quarter distance of the Kentucky Derby on May 2, 1964, defeating Hill Rise by a neck. 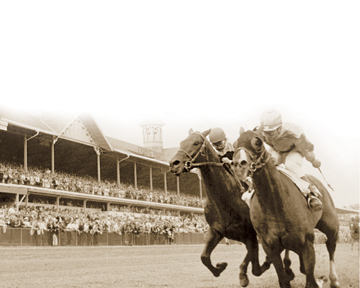 Not only was it one of the most thrilling stretch runs in Derby history at Louisville’s Churchill Downs, it was the fastest time in which the most famous horse race in the United States had been run, a record that was later surpassed by Secretariat in 1973. In winning 14 of his 18 career starts, Northern Dancer proved wrong the potential buyers who had rejected him as a yearling because he was too small. Bred by E. P. Taylor, the colt was put up for sale with a $25,000 price tag with Taylor’s other yearlings. When the colt was not sold he became a part of Windfields Farm’s racing stable. As a 2-year-old, he won seven times and was second twice in nine starts. His victories included the Summer Stakes at Fort Erie, the Coronation Futurity at Woodbine, the Carleton Stakes at Greenwood and the Remsen Stakes at Aqueduct. The Remsen win established Northern Dancer as a horse to watch in the Triple Crown races, which he confirmed in March of his 3-year-old season by winning the Flamingo Stakes in Florida, becoming the first Canadian-bred to win a $100,000 race. He then won the Florida Derby and the Blue Grass Stakes at Keeneland before his Derby, Preakness and Plate victories. As a stallion, Northern Dancer has proven to be even greater at stud than he was on the racetrack. By 2000 and the dawn of a new millenium, the Dancer’s worldwide influence on the breeding industry was unparalleled and considered by horsemen as the greatest of the 20th century. His offspring have gone on to make millions; he is the sire of innumerable champions on four continents; one of his yearlings sold for a world-record $10.2 million; he has fathered 146 stakes winners (including Danzig, Sadler’s Wells, who sired some 190 stakes winners himself, The Minstrel, Storm Bird, Lyphard, Nuryvev, Vice Regent and Nijinsky II ) and late in life, at the advanced age of 21, would attract a bona fide offer of $40 million from a French syndicate. In 2004 all 18 starters in Europe’s most famous race, the Prix de l’Arc de Triomphe in Paris, had Northern Dancer’s blood in their pedigrees. Foaled on May 27, 1961, at Taylor’s farm in Oshawa, the Dancer initially stood at stud at Windfields in 1965 for a fee of $10,000. 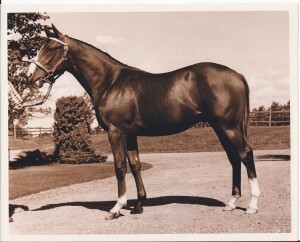 His incredible sire statistics were unheard of and in 1968 he was shipped to Taylor’s farm in Maryland. Leading sire in both England and North America, his blood was so intensely sought after that his stud fee soared to over $1 million in 1981. His 14 yearlings in 1984 averaged an astounding $3.3 million at auction. The Dancer was pensioned in 1987 and died on Nov. 16, 1990, at age 29 at Windfields’ Maryland property. He was buried at Windfields in Oshawa. In 2013, a collection of memorabilia, trophies and photographs belonging to E. P. Taylor and Windfields Farm, including significant trophies won by Northern Dancer, were provided by the Taylor family to the Canadian Museum of History. An exhibit featuring some of these items opened in May of 2014.